1:15 p.m.: Penguins coach Mike Sullivan said winger Phil Kessel, who did not practice but obviously is dealing with at least one injury, took a maintenance day. Sullivan said center Derick Brassard, who also did not practice, is progressing but noted that Brassard had yet to skate. That would make it seem unlikely Brassard will play Thursday at Columbus. Several players were asked about Thursday’s game at Columbus. They all, not surprisingly, said they expected it to be playoff-like. Center Evgeni Malkin did a relatively long session with reporters. We will bring you a report on that, as well as a player feature for Extra, later today. 11:30 a.m.: At the actual practice — the only one where players wear their game socks — the three players absent are forwards Phil Kessel, Derck Brassard and Carter Rowney. The latter two are injured, while Kessel is pretty obviously playing hurt. It doesn’t look as if we will get line rushes today. We eavesdropped on coach Mike Sullivan at the start. He outlined some shooting drills, some skills work, some power-play time and some defensive zone work, with an emphasis on the players getting their heart rate up. He said it would be a 45-minute session. 10:50 a.m.: Annnnd … everybody got pretty. Looks as if co-owners Mario Lemieux and Ron Burkle are not here, so the team is using stand-ins (sit-ins?) and will do some hocus-pocus with the photo later. 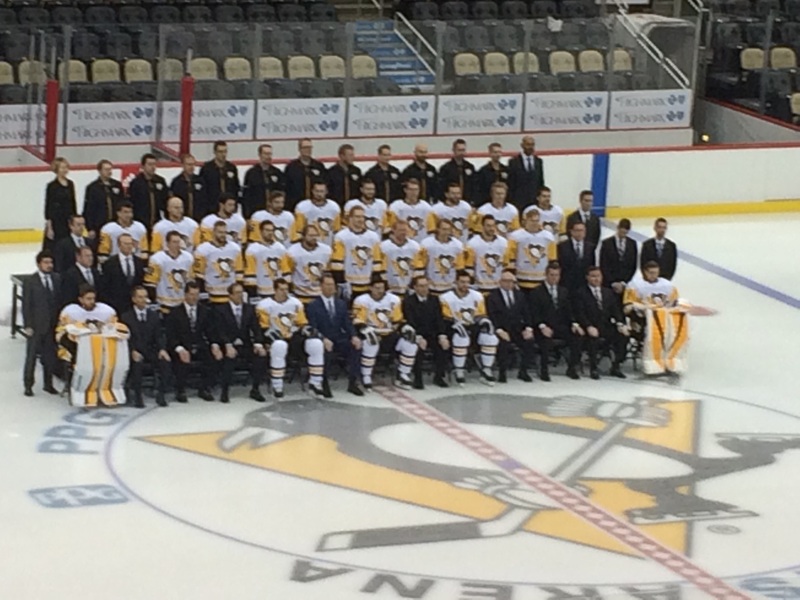 10:40 a.m.: Before practice, it will be team photo day, which is why the Penguins are at PPG Paints Arena rather than in Cranberry. 10:15 a.m: The Pittsburgh Penguins will end their season with back to back games, Thursday and Friday. The Penguins play in Columbus Thursday, then at home against Ottawa Friday. Obviously, the game in Columbus could mean far more to the Blue Jackets than the Penguins. The Penguins practice today at PPG Paints Arena. Our Shelly Anderson is covering the festivities. Check back to this column for updates.